The 2nd USA Cycling BMX Junior Development Program series camp was held the week of June 18-23rd. 13 of the top Jr Devo riders that qualified from racing the Jr Devo series at the USA BMX events were hand picked to attend the camp. Designed to give the next generation of BMX riders not only a chance to ride at the USA Olympic training center on 2 of the Supercross tracks on site, but learn all aspects of training from the staff at the OTC Jr Devo Program. An outlined program from Camp Directors Brian Fell, Jerry Bradford, and Elite Rider Tyler Brown gave the riders direction for the week. The Jr Devo campers go through seminars and hands on instruction in many different areas, such as Nutrition, Recovery, Dynamic Warm Up, Gym, Weights, and more. Riders are also tested in many areas to further help develop training programs and address areas of improvement that the riders may need help in the fundamentals for BMX racing. The riders were also on the Supercross track for 2 training sessions a day while at the camp. This camp was special, as with the newly completed London replica track, the campers were able to ride both SX tracks on site and see the true progression of the SX tracks. The riders went through the entire camp honing in their skills and it would all culminate on Friday with a time trial for each rider to qualify for a mock race, held on Saturday. The riders were given 2 chances to complete the track, and the faster of the 2 times would be used to seat the racers for the motos for Saturday race. Chase BMX Olympian Connor Fields was on hand for a few days of the camp as well to ride with the Jr Devo riders, as well as give advise and tips to the riders. Also on hand during the camp were fellow BMX Olympians Nic Long, Arielle Martin, and Alise Post. The Jr Devo Riders that attended the camp were: Shaelen Reno, Carlie Ferree, Cameron Moore, Collin Hudson, Gavin Nelson, Tucker Rice, Hunter Pelham, Matt Chism, Tyler Wagner, Caleb Minthorn, Ryan Zinzow, Luke Roarty, and Justin Knapper. The riders were quite impressive on the SX tracks as well as at the camp itself. The mens overall winner in the mock race was Collin Hudson, with Cameron Moore in 2nd, and Tucker Rice in 3rd. You can watch a video of the final here (iPhone Video) Hunter Pelham was on the rear wheel of Hudson but crashed out in the final over the berm jump. Hunter walked away from the crash. The future of BMX in the USA is very bright and the Jr Devo program is helping guide the young riders to the top of the SX podium in the future. Prizes were donated to the camp from Chase BMX Team supporters and some of the best in BMX: Tioga, Oakley, Kicker, ODI, USA BMX, Insight, Elevn, and Kingstar. Thanks so much for your support to the Chase BMX team and the Jr Devo Camp series. The USA Cycling BMX Junior Development Program Series (JDP) is designed to take our next generation of young talented amateur BMX athletes to the highest level of BMX racing. The goal of this program is to prepare this group by allowing unprecedented access to the U.S. Olympic Training Center in Chula Vista, California. The program is targeting all 15 and 16-year-olds using the 2012 UCI BMX calendar. There are 2 more camps left for the 2012 year: Aug. 13-18 and Oct. 15-20. Riders qualify to attend the camps with results during one of four qualification periods in USA Cycling’s BMX Junior Development Series. To learn more about the series, camps or how to qualify, please visit USA Cycling’s BMX Junior Development Program web page. Chase BMX frames were created to bring the BMX racing world a new standard for the Elite level of BMX racing frames. No gimmicks, just straightforward technological advancements to offer you the lightest and stiffest frames. These advantages allow you to get all the human generated power to the ground, and give you the biggest advantage offered from any current BMX frame – The winning advantage. Tioga BMX is the maker of the winningest tire in BMX history and has deep roots in the sport. Working with the worlds fastest pro riders, Tioga uses feedback from the best R&D team you could ask for to continue to improve on our winning products. Tioga’s commitment to that is the Fast 2 line. Fast ‘squared’ is Tioga’s commitment to developing BMX racing components that gets you from point A to point B Faster. Than. Ever. Whether getting faster requires lighter components, components to give you greater control, or something else,2Tioga will keep tweaking and innovating to find it. Race with Tioga components and be confident that you are racing on Precision Fast2 Gear. 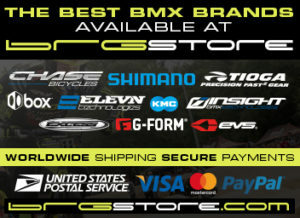 The mission at J&R Bicycles is to provide the highest quality of service and products to BMX riders from around the world while supporting the growth of the sport. J&R into the largest BMX only store in the world.